The diverticulum of the sigmoid colon is relatively common in the gastrointestinal tract, with the majority of cases being asymptomatic. A non-traumatic hemoperitoneum secondary to colonic diverticulum is very rare. Here, we report the case of a 35-year-old woman with hemoperitoneum caused by the bleeding of the serosal vessel of the sigmoid colon diverticulum. 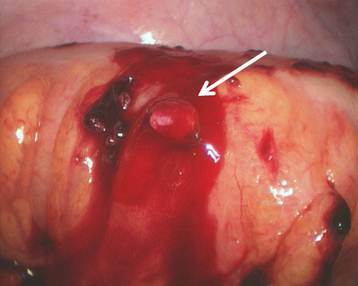 The bleeding focus was identified and ligated, and the diverticulum was invaginated laparoscopically. No blood vessel malformation was detected. A colonic diverticulum, which is associated with aging and low-fiber diet, is the most common disease in Western countries . The causes include changes in colon wall resistance  and colon motility . In most cases, it is asymptomatic, but major complications could include diverticulitis and intraluminal hemorrhage [4, 5]. Interestingly, intraperitoneal hemorrhage of a colonic diverticulum is extremely rare, but very fatal. Herein, we report a case of colonic diverticulum that manifested as hemoperitoneum. 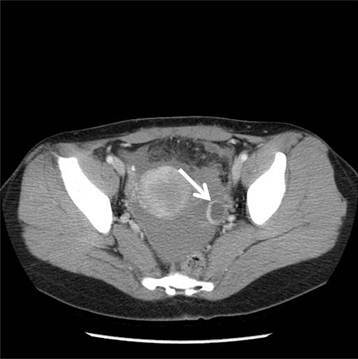 A 35-year-old woman presented with a 24-hour history of left lower-quadrant abdominal pain. She underwent tubal ligation for contraception when she was 30 years old, and there were no signs of trauma. She had no history of ectopic pregnancy or any hematologic disorder and did not receive anti-coagulation treatment. She was hemodynamically stable. Her hemoglobin level was 13.1 g/dL, and the white blood cell count was 5.9 × 109/L. A coagulation test conducted showed normal results. Urinary pregnancy test was negative, and computer tomography scan showed fluid collection and cyst formation in the left ovary (Fig. 1). Culdocentesis confirmed hemoperitoneum. On the basis of her clinical manifestations, hemoperitoneum secondary to the ovarian cyst rupture was suspected, and laparoscopic surgery was planned. During laparoscopy, more than 500 ml of blood and blood clots were evacuated. A 2-cm large left ovary cyst was noted, but there was no bleeding in both the ovaries and fallopian tubes. Hematoma in the omentum was noted, but there was no omental bleeding. On examining the sigmoid colon, a diverticulum, 10 × 2 × 1 mm in size was found, and the bleeding focus was identified in the proximal part of the sigmoid colon (Fig. 2). No evidence of intraluminal bleeding was noted; however, the diverticulum site could not be clearly examined during intraoperative colonoscopy owing to incomplete bowel preparation. The bleeding was controlled by #3-0 Vycryl intracorporeal suture, and the invagination of the diverticulum was performed laparoscopically. The recovery was uneventful, and the patient was discharged on postoperative day 4. Fluid collection and left ovary cyst was noted on computed tomography. The size of ovary cyst was 2.0 × 1.8 cm (arrow). Spontaneous diverticular bleeding of the sigmoid colon (arrow). The prevalence of diverticulum in patients aged 65 years or more is as high as 65%, but merely 5% in those below 40 years of age . Sigmoid colon diverticulum is closely associated with high luminal pressure and weak bowel wall, which create pulsion diverticula on the sigmoid colon . First, the colon consists of a monolayer of inner circular muscle, which makes its wall weak, as compared to the small intestine that is formed of the inner circular and outer longitudinal muscle layers. The vasa recta, which supply the mucosa and submucosa of the colon, penetrate the circular muscle. The weakness of the vascular portals in the circular muscle possibly causes mucosal herniation into the subserosa . Second, the small diameter of the sigmoid colon causes a high intraluminal pressure. A low-fiber diet, colon segmentation, long transit time of small stool volume, and abundant innervations of the cholinergic nerve all contribute to the high intraluminal pressure [1, 9-11]. Thus far, only 1 case of hemoperitoneum resulting from colonic diverticulum has been reported . The cause of hemoperitoneum in that case was the hypertensive change , while in our case, the spontaneous bleeding of the serosal vessel of the colonic diverticulum led to hemoperitoneum. Laparoscopic resection of Meckel's diverticulum was successfully performed in an emergency condition . In addition, laparoscopy has fewer postoperative complications than conventional laparotomy in sigmoid colon resection performed for diverticulum . Invagination and diverticulectomy have been performed to treat diverticula to preserve the blood supply to the intestine. In the present case, blood supply to the intestine had to be preserved because the patient had hemoperitoneum. In addition, the remaining colon wall was normal, but the bowel preparation was poor. The invagination of diverticulum has an advantage over diverticulectomy in that it minimizes bowel leakage . Moreover, invagination of diverticulum can be easily performed using laparoscopy with a simple suture technique. Therefore, we decided to invaginate the diverticulum instead of using diverticulectomy. We reported a case of colonic diverticulum that was successfully treated by laparoscopic suture and invagination of the diverticulum. Our case highlights the occurrence of hemoperitoneum as the complication of colonic diverticulum.